National Fire Danger Rating fuel models (Deeming and others 1977, Bradshaw and others 1984) have been mapped across the lower 48 states at 1 km resolution (Burgan and others 1998). The map was derived from a combination of satellite imagery used to create a land cover database for the conterminous U.S. (Loveland and others 1991), and ground data sampled from across the U.S. (Burgan and others 1997, Burgan and others 1999). The data are available under "data archive" in ArcInfo format. A conversion can be made to a grid using IMAGEGRID and displayed in ARCPLOT with GRIDPAINT using the nfdrfuel.clr colormap file. The archive file also contains a metadata text file that describes the projection information for the map. Not all 20 NFDRS models were mapped. Fuel model E (hardwoods after leaf fall) was not used. Only model R was used for hardwoods because the live load can be transferred between the live and dead vegetation classes as a function of changes in vegetation greenness as observed from satellites. The slash fuel models (I, J, and K) were not used because the location, extent and condition of activity fuels changes relatively quickly. 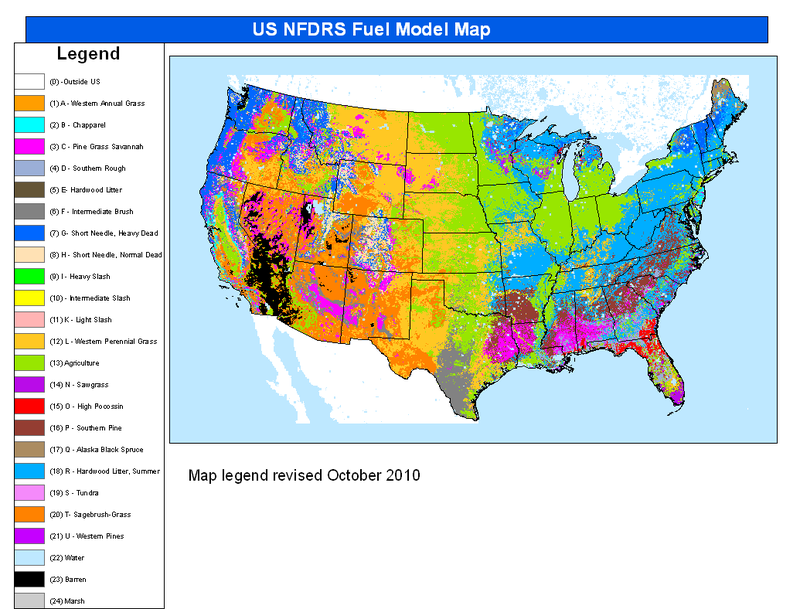 To construct the fuel model map, ground sample data was obtained from 2560 1 km square plots scattered randomly across the U.S., and an NFDR fuel model was assigned to each plot. This data, combined with the landcover class data and an Omernick Ecoregion map, permitted counting the number of times a fuel model was assigned to each sampled landcover class within each ecoregion. A computer program was written to use these assignments to prepare a preliminary NFDR fuel model map. This preliminary map was then revised by having at least one person from each Forest Service Region come to the Fire Sciences Laboratory to review the map. This person was well versed in the location and extent of vegetation in the region, and what NFDR fuel models best represent it. It must be kept in mind that this map is intended for use to assess fire danger across the continental U.S., not for fire behavior assessment at any specific site. Without doubt various individuals will disagree with fuel model assignment for certain small areas, but the purpose of the map must be remembered -- rating fire danger across large geographic areas.